Ocean Lakes Resort is a wonderful place you can come and let the kids go and enjoy themselves, while you enjoy your vacation. Security guards are always on patrol in the Park. New for 2016 our Water Park, with 2 water slides, lazy river, Water activity for the little ones in the Splash Zone. 3 Kiddie pools along with the olympic sized pool and our indoor pool. Mini Golf Course located by the pools. Recreation center with over 80 games for the young and old alike. Recreation center also has entertainment such a shows and movies. This is also where our non-denominational services are helt on Sundays. Snack Bars and a country store with gift shop are also on site. 3 Ocean Front playgrounds, horseshoe pit, basketball court, and shuffle board for the teens and older folks. A Skateboard park is located under the Observation Deck located on the Ocean Front. There are camps all summer for the kids , 9 am to Noon, so you can sunbath in peace, or shop at one of the local sho The Mile Long Private Beach is a wonderful place to relax and catch some rays. Golf carts are available to rent, and you can ride for hours in the 310 acree park. Of course Fishing in the freshwater ponds or out on the beach. Spacious Family Home: Very comfortable and well equipped for your vacation enjoyment. Loiving room seats 9 with 47" LCD Flat Screen Tv. House also has internet access and a DVD Player. There are tvs in all bedrooms. Washer and dryer on site for your convenience. Central Vacumn installed for easy cleanup. Kitchen equipped with all appliance and utensils for the Chef in the family.Outside wicker furniture makes a wonderful retreat to enjoy the ocean breezes. Deck seating for meals cooked on the Webber grill. Comfortable Family House: This is our personal home from Late August THRU Early June. We live here at the beach as much as possible. 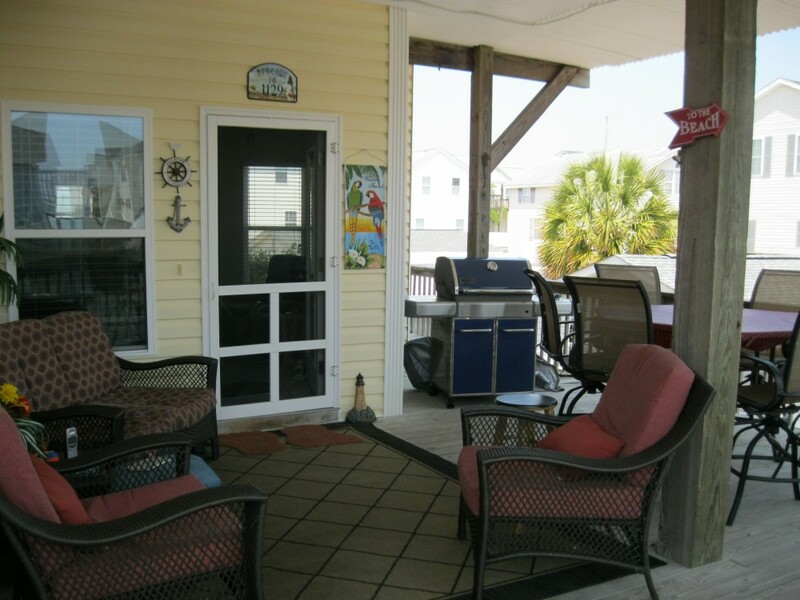 We would love to have you come to the beach and enjoy our lovely home. Come and enjoy the beach and make 1129 your home away from home.